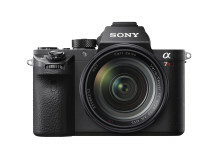 Sony today introduced their new flagship full-frame mirrorless camera, the α7R II (ILCE-7RM2). The new α7R II interchangeable lens camera features the world’s first back-illuminated full-frame Exmor R CMOS sensori, which delivers high resolution (42.4 MP approx. effective megapixels), high sensitivity (expandable up to ISO 102400)[i] and high speed AF response up to 40% faster than the original α7R thanks to 399 focal plane phase detection AF points. The camera also includes a 5-axis image stabilisation system borrowed from the acclaimed α7 II model and can shoot and record 4K video in multiple formats including Super 35mm (without pixel binning) and full-frame format, a world’s first for digital camerasi. 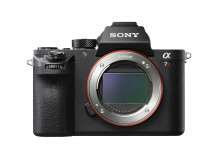 Additionally, it has a newly refined XGA OLED Tru-Finder with the world’s highest (0.78x) viewfinder magnification[ii]. Additionally, the sensor’s back-illuminated structure, with an expanded circuit scale and copper wiring design, enables faster transmission speed and ensures content can be captured in high resolution without sacrificing sensitivity. Data can also output from the sensor at an approximately 3.5x faster rate compared to the original α7R. The α7R II has a new highly durable reduced-vibration shutter that delivers 50% less vibration from shutter movements compared to its predecessor, and has a cycle durability of approximately 500,000 shots[iii]. The camera can also be set to Silent Shooting mode in order to shoot images quietly without any sensor vibration or movement. 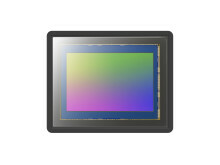 The new image sensor features 399 focal-plane phase-detection AF points – the world’s widest AF coverage on a full-frame sensori – that work together with 25 contrast AF points to achieve focus response that is about 40% faster than the original model. The α7R II utilises an advanced motion-detection algorithm combined with this Fast Hybrid AF system to achieve up to 5fps continuous shooting with AF tracking. The new flagship α7R II model is equipped with an innovative 5-axis image stabilisation system that has been fine-tuned to support its high-resolution shooting capacity. Similar to the system launched on the acclaimed α7 II model, this advanced form of image stabilisation corrects camera shake along five axes during shooting, including angular shake (pitch and yaw) that tends to occur with a telephoto lens, shift shake (X and Y axes) which becomes noticeable as magnification increases, and rotational shake (roll) that often affects video recording. This camera shake compensation system is equivalent to shooting at a shutter speed approximately 4.5 steps faster[iv]. Additionally, the 5-axis stabilisation works cooperatively with Sony α lenses with optical SteadyShot™ (OSS) to provide maximum stabilisation and clarity, while also performing admirably via a compatible mount adapter with Sony α A-mount lenses[v] without on-board stabilisation. Effects of the stabilisation can be previewed via live-view on the LCD or OLED viewfinder of the camera. 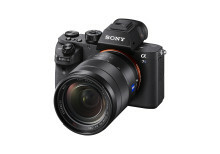 The impressive video credentials of Sony’s new α7R II camera include the ability to record movies in 4K quality (QFHD 3840x2160) in either Super 35mm crop mode or full-frame mode. In full-frame mode, the α7R II utilises the full width of the 35mm sensor for 4K recording, allowing users to utilise the expanded expressive power of the sensor. 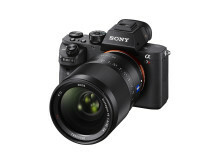 It is the world’s first digital camera to offer this in-camera full-frame format 4K recording capacityi. The camera utilises the advanced XAVC S[vi] codec during video shooting, which records at a high bit rate of 100 Mbps during 4K recording and 50 Mbps during full HD shooting. The new full-frame α7R II has an upgraded XGA OLED Tru-Finder™ with a double-sided aspherical lens that delivers the world’s highest viewfinder magnificationiii of 0.78x for crystal clear image preview and playback across the entire display area. ZEISS® T* Coating is also utilised to reduce unwanted reflections that interfere with the shooting experience. 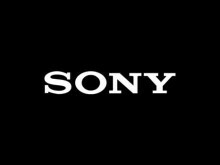 The new α7R II camera is Wi-Fi® and NFC compatible and fully functional with Sony’s PlayMemories Mobile™ application available for Android™ and iOS platforms, as well as Sony’s growing range of PlayMemories Camera Apps™, which add a range of creative capabilities to the camera. For example, there is more creativity available now for time-lapse photography thanks to a new “Angle Shift add-on”[vii] app allows users to easily add pan, tilt and zoom to time-lapse images without any additional shooting equipment or PC software required. Learn more at www.sony.net/pmca. 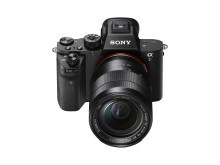 The α7R II will start shipping in Europe in Summer 2015 and will be priced at approximately €3,500. 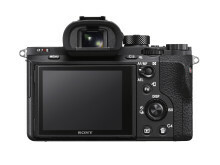 [iii] According to Sony internal testing,with the electronic front curtain shutter activated.